Most people don’t know what the steps are to take when it comes to removing mold from a home or business. And, in all reality, that’s alright, because the only way to properly remediate mold is to get professional help. However, it still helps to know what to expect as a home or business owner who notices the smell, symptoms, or even sight of mold. So, we’ve come up with five steps people should take the moment they think they may have come across the presence of mold. In most cases, you’ll be able to identify the presence of mold for yourself. Mold gives off a pungent, unpleasant smell that can resemble old, wet socks. And, likes to grow in dark, wet places. Usually, you’ll be able to identify mold by simple sight and smell. 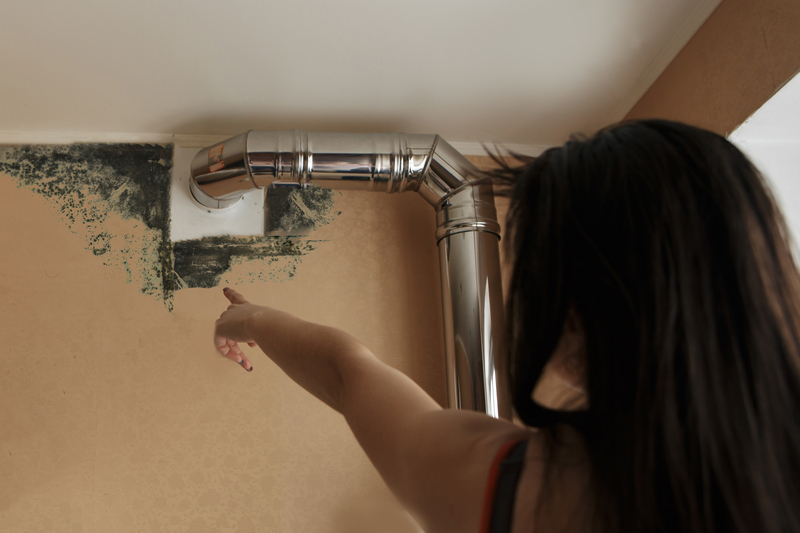 But, if you need to prove the presence of mold for insurance purposes, you might want to consider getting a professional to come out and test for mold. Since the presence of mold can be a health hazard, it’s important to remove yourself, family, pets, and/or employees from the scene until the mold issue can be resolved. Mold can lead to a number of issues like coughing, sneezing, congestion, eye irritation, wheezing, and skin rashes. Furthermore, it can make health issues in the elderly and children even worse due to its lingering effects on the immune system. While getting up and leaving your home or place or business can be stressful, if you care about your loved one’s health, you’ll make the decision to leave until the mold is removed. So, if you’ve been waiting for the perfect time to take the family on a vacation getaway, now might be your perfect option. Furthermore, remember to leave anything in the structure affected by mold that may have been near the presence of mold. This way, these belongings can also be remediated of mold and the mold doesn’t spread to where you’re staying temporarily. Certainly, to address something as serious as mold, you’ll want to invest in a professional company that knows what they’re doing. And, can help to effectively and immediately begin removing mold in your home or business. But, how can you be sure a company is as good as they say? Well, a professional service will let you know what you can expect as far as the mold remediation process without industry terms as to confuse you. Rather, they’ll help you to understand what needs to be done and why that is so you can understand the process for yourself. Furthermore, a professional mold remediation company will be licensed, insured, and bonded. With these qualifications, you can ensure that the company you choose is professional and experienced in the industry. Finally, don’t forget the power of reviews! Previous clients of mold removal companies will be sure to let others know of their bad experiences on Yelp, Facebook, or even the BBB, so make sure to do your research before hiring. Once the remediation process is complete, you won’t be able to move back in until the area is deemed healthy due to the removal of mold. This can be completed by having a mold inspection done after the process is complete. Most mold removal companies will include this in the cost of their services, but be sure to ask before you hire! Think you may be experiencing mold? If you’re looking for a company you can trust in South Florida, consider A Plus Mold Remediation Inc. To get a free quote or ask us questions about our mold remediation team or services, contact us today!